Endoscopic ear surgery is a new technique being pioneered at Columbia Otolaryngology. In some cases, endoscopic ear surgery may result in a less invasive operation that can be performed entirely through the ear canal. The endoscope is one of two tools surgeons can use to see well during ear surgery. The other tool is a specialized microscope. The ear contains some of the smallest structures that can be operated upon. For example, the three bones of the middle ear (called ossicles) are the smallest bones in the human body. The smallest of these (the stapes) is so tiny that seven of them could fit across a penny. In order to perform surgery on anatomy this delicate, surgeons often use a microscope. Microscopes have been used in otology for over seventy years. They make structures appear larger and have a very bright light. Surgical microscopes are large devices, weighing hundreds of pounds. The lens of the microscope needs to be about a foot away from the object (or target) the surgeon is looking at. As a result, other structures between the target and the lens can block the view. For example, the ear canal (or external auditory canal) is shaped like a bent tube, and can often get in the way. Bone can also obstruct the view with a microscope. To overcome blocked views, surgeons sometimes need to make a larger incision (for example behind the ear canal) or drill away bone. An endoscope is another type of device that can help surgeons see during surgery. It is shaped like a narrow tube and the lens is at the tip. The lens can be placed extremely close to the target, less than half an inch (or thirty times closer than with the microscope). This allows a very detailed view. Because the endoscope is so narrow, it can be slid past blocking structures. In some instances, this can avoid a larger incision or prevent drilling away of blocking bone. The endoscope also provides a wide panoramic view, whereas the microscope provides a narrower view. (See Figure) Finally, endoscopes can have angled lenses, allowing the surgeon to literally see around corners. Endoscopes are not a new technology; however recent improvements have allowed high quality endoscopes small enough to use for ear surgery. The microscope and endoscope each have their own advantages and disadvantages. The microscope produces three dimensional images, whereas the endoscope produces two dimensional images. However, because the endoscope can be easily moved around, surgeons can get a sense of 3D (called pseudo-3D). The endoscope must also be held in the surgeon’s hand, leaving only one hand left to operate. As a result, endoscopic ear surgeons need specialized experience. The endoscope may sometimes be used in combination with the microscope. For example, after removing a middle ear growth called a cholesteatoma, a surgeon may use an endoscope to look around to see if any pieces are left. 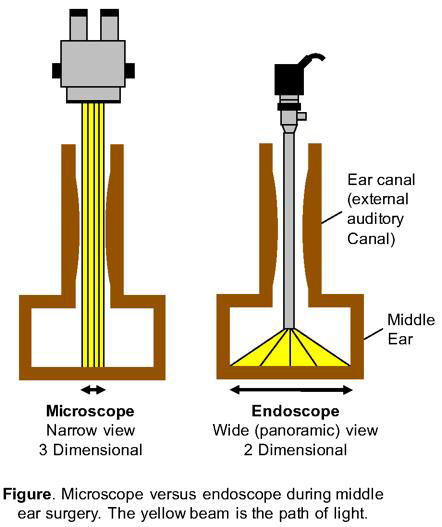 The ideal purpose of the endoscope is to allow surgery through the ear canal, which is the natural opening into the middle ear (this is termed transcanal endoscopic ear surgery, or TEES). A microscope can also be used to perform surgery through the ear canal; however, sometimes larger incisions or more bone removal is required in order to see well. Surgeons at Columbia University Medical Center are actively researching what types of surgeries are best for an endoscopic approach. Several disorders include eardrum (tympanic membrane) perforations, cholesteatomas limited to the middle ear, and problems with the ossicles (bones in the middle ear) causing a conductive hearing loss. The endoscopic ear surgery program at Columbia is the first in the New York metro area. Click here to make an appointment with one of our otologists.